22348 c vc Failure to use designated lanes | What is the fine amount and cost of 22348 c vc | $238 1 DMV point - Fight California Traffic Ticket with Ticket Ninja! 22348 c: A vehicle subject to Section 22406 shall be driven in a lane designated pursuant to Section 21655, or if a lane has not been so designated, in the right-hand lane for traffic or as close as practicable to the right-hand edge or curb. When overtaking and passing another vehicle proceeding in the same direction, the driver shall use either the designated lane, the lane to the immediate left of the right-hand lane, or the right-hand lane for traffic as permitted under this code. If, however, specific lane or lanes have not been designated on a divided highway having four or more clearly marked lanes for traffic in one direction, a vehicle may also be driven in the lane to the immediate left of the right-hand lane, unless otherwise prohibited under this code. This subdivision does not apply to a driver who is preparing for a left- or right-hand turn or who is in the process of entering into or exiting from a highway or to a driver who is required necessarily to drive in a lane other than the right-hand lane to continue on his or her intended route. 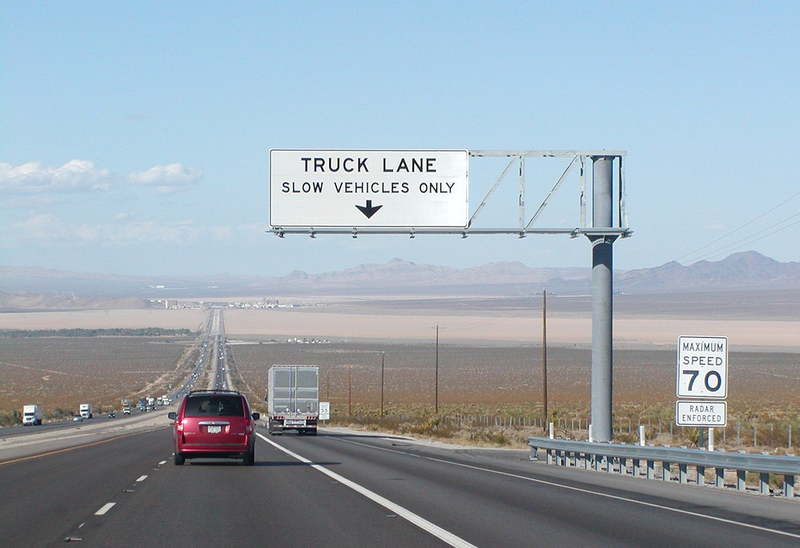 Almost always, lane violation tickets in California are given out on highways and freeways with at least 2 lanes in each direction with speed limits of 65 mph or 70 mph for regular traffic. Please see 22349 a vc and 22356 b vc. Speeding tickets for violation of Section 22406 a of the California Vehicle Code are one of the most common type of traffic tickets for commercial drivers in California. Most of these speeding tickets are issued by the California Highway Patrol (CHP). How much is 22348 c vc? The true cost of 22348 c vc may be much higher than the fine amount for the speeding ticket in the long term as the DMV point can lead to higher auto insurance rates for three years of more. At Ticket Ninja CA, we are the experts when it comes to helping you to get your speeding citation dismissed. We use a proven method of Trial by Written Declaration that gives you two chances to get your traffic ticket dismissed. Our fee is a very reasonable $99, and it comes with a 100% money back guarantee if your lane violation ticket is not dismissed! Click here to get started today!